In the evening hours approaching midnight, Northern Hemisphere skywatchers will be able to spot the brilliant bluish-white star Vega (pronounced VEE'-guh, not VAY'-guh, unlike the car model from the '70s) as it shines nearly overhead this week. On July 17, 1850 — 167 years ago — Vega became the first star (other than the sun) to be photographed, when it was imaged by William Bond and John Adams Whipple at the Harvard College Observatory. Using the daguerreotype photograph-producing process of the day, it took an exposure of 100 seconds to capture an image of Vega. In January 2005, astronomers at the Harvard-Smithsonian Center for Astrophysics in Cambridge, Massachusetts, announced that features observed in a cloud of dust swirling around Vega may be the signatures of an unseen planet in an eccentric orbit around the star. In Earth's solar system, dust particles created by asteroid collisions and the evaporation of comets spiral in toward the sun. The gravity of the planets affects the distribution of these dust particles. Observations of Vega with the Infrared Astronomy Satellite in 1983 provided the first evidence for a href="https://www.space.com/9662-wallpaper-27.html">large dust particles around another star, possibly debris related to the formation of planets. This discovery likely inspired Carl Sagan to place an alien listening post at Vega in his novel "Contact." Lyra is also a rich repository for observers with amateur telescopes. Two fainter stars form a small triangle with Vega; one of these also joins three others in a parallelogram, a rather uninspiring star pattern. 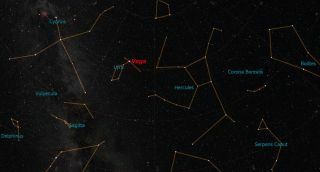 However, you should try to locate Epsilon Lyrae, the other faint star in the Lyra triangle. Here lies much more than meets all but the sharpest eye. Appearing to the average eye as a single star, it may be seen as a very close double by those with exceptional vision — the two stars are separated by just over one-tenth of the apparent diameter of the full moon. Through binoculars, Epsilon Lyrae easily splits into two stars. But then, using a 3-inch (7.6 centimeters) or larger telescope reveals that these two stars are themselves both doubles! That makes four stars for Epsilon Lyrae, better known as the "Double-Double" star in Lyra. The star Sheliak is one of the two stars that form the southern side of the parallelogram and appears to diminish by half of its normal brightness about every 13 days, when it's eclipsed by a darker companion star. Between this winking star and its neighbor, Sulafat, is the famous Ring Nebula, Messier 57. Visible in small telescopes as a tiny oval patch of dim light, it is the gaseous shell puffed out from a dying star, which is evolving to become a white dwarf. Millions of years ago, this star exploded, hurling out great masses of gas. We see the star now through the thin part of this gaseous envelope. Many star books refer to Lyra as a harp. But that's not quite the case. In terms of size, a small harp can be played on a person's lap, whereas larger harps (like the one that was used by the late Harpo Marx) are quite heavy and must rest on the floor. But Lyra represents a lyre (pronounced like "liar"), which is quite a different instrument entirely. A classical lyre has a hollow body constructed out of turtle shell, which served as a sound-chest or resonator. To play a lyre, people would not strum the strings with their fingers as they would with a harp but rather play it like a guitar or ukulele, with a pick (called a plectrum). Many hundreds of years ago, if a young man were courting a young lady, he might take her to a dark, quiet and serene setting, and as she gazed upward at the starry firmament, he would entertain her by playing his lyre. Many years ago, Dr. Fred Hess, a very popular lecturer at New York's Hayden Planetarium, would tell his audience that this romantic tradition actually continues to this very day, but without the instrument. "On any given summer night, a young man might take his girlfriend to a beach or parking lot," he would say. "And as she stared up and looked into the starry night sky, in all likelihood, she too was probably listening to a liar."